Combining objects when updating a DynaMesh can also be done through the SubTool sub-palette, in a similar way to the Remesh All function. When doing this, DynaMesh will use the SubTool operator icons found in every SubTool. For more information on Remesh All and its operators see here. The currently selected SubTool must be in DynaMesh mode. The SubTool to be merged must also be assigned the white polygroup (Group As DynaMesn Sub). If both of these are true, performing a Tool >> SubTool >> Merge Down operation will subtract the merged mesh from the current one. 1. Make sure that the DynaMesh SubTool is above the SubTool you wish to merge with. 2. The SubTool that is immediately below your selected DynaMesh SubTool must have the Difference icon selected. This is the second icon in the SubTool icons. 3. Now select the second SubTool, and in the Tool >> PolyGroups sub-palette click the Group As DynaMesh Sub button. This will convert the SubTool that will be used as a subtraction into a white polygroup. 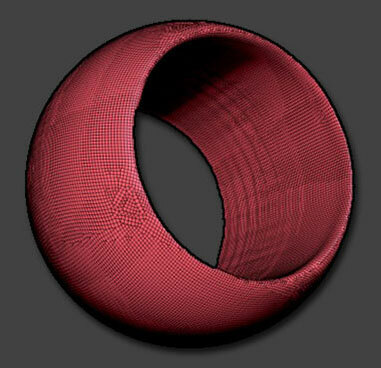 When using DynaMesh a white polygroup is an indicator for ZBrush to use that mesh as a subtraction. 4. Select the DynaMesh SubTool (the sphere in this example), and click on the MergeDown button found in the Tool >> SubTool sub-palette. 5. Hold CTRL and Click+Drag anywhere in the open document to perform a DynaMesh re-mesh. 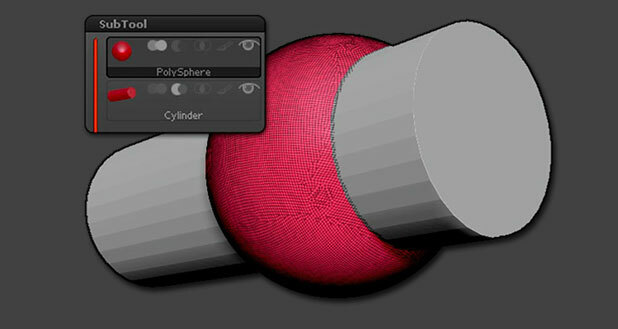 ZBrush will use the Cylinder to create a hole through the sphere. When using the Merge Down command for subtraction, make sure to have the DynaMesh selected. If you instead have the subtractive mesh selected, ZBrush will see this as an addition and combine the SubTools instead of subtracting. The function Merge Down cannot be undone. If you are not sure of the result of your operation, you can duplicate the SubTools as a backup and hide them. 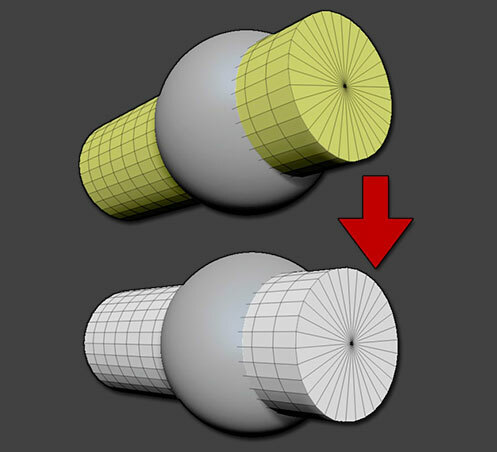 Previously, if you hadn’t pressed the ALT key while inserting a mesh, it wasn’t possible to use the new mesh as a negative one and subtract it from the current DynaMesh object. The new Tool >> Polygroups >> Group as Dynamesh Sub function will also allow an inserted mesh to be converted to a subtraction. Please refer to the Polygroup chapter of this documentation for more information on this feature.